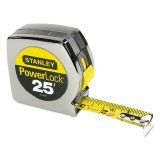 Stanley Powerlock II Power Return Rule, 1" x 25ft, Chrome/Yellow - Powerlock Tape Measure features a Mylar-protected blade that remains rigid when extended 7'. Blade and spring are easily replaced with drop-in cartridge. Offers positive blade lock and attached belt clip. Measurements are in Imperial.